Sea Caves in Burlington, VT??? Correct me if I’m wrong, but isn’t Vermont two states or a country away from the ocean? You’ve either got to drive up through Canada or speed threw New Hampshire and Maine to see the Atlantic. Don’t even ask about the Pacific. So, how did sea caves end up right next to downtown Burlington. And how the hell did I not know they were there for my first 4 years of living right next door to them! I had to move to Williston to find sea caves in Burlington. According to my buddy Michael’s post about the Donahue Sea Caves (hit his site to get driving directions) they were formed over 10,000 years ago when Lake Champlain was known as the Champlain Sea. Ahhh….it all makes sense now. 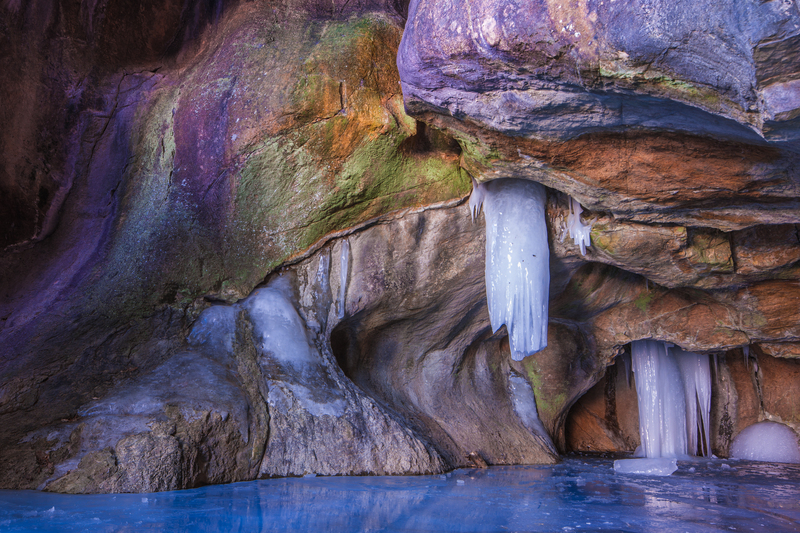 The sea caves become ice caves in winter and can be found in the Old North End of the downtown area. When Vermont gets an incredibly cold winter, like the one we’re beginning to put behind us, the sea caves become ice caves. 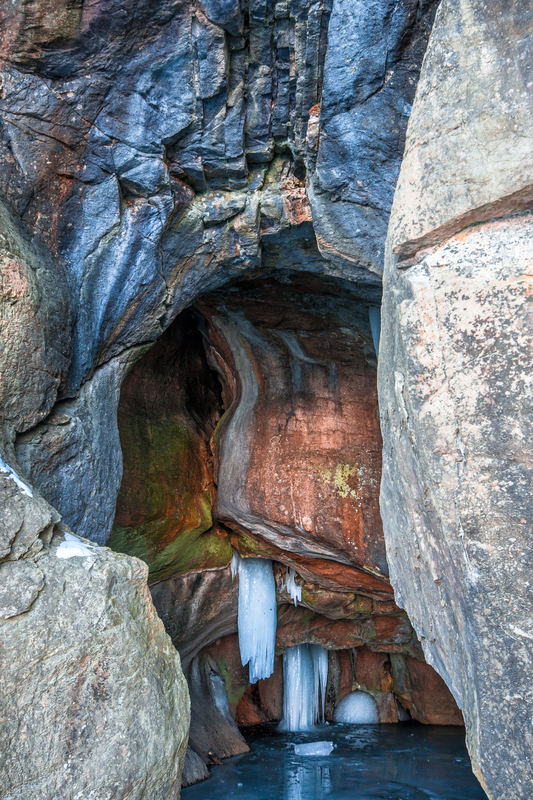 It also makes the trek easy: park the car, walk down the hiking trail, walk on the frozen pond, walk into the ice caves. Simple. During the summer, it is virtually the same formula, but you have to carry a big friggin’ canoe down the steep hill. No thanks. 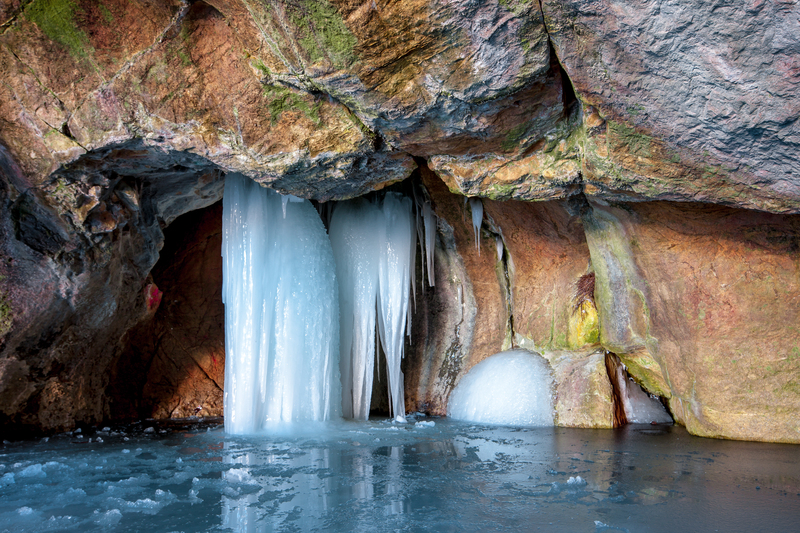 In the back of the cave ice shoots touch the frozen floor next to a summer bird’s nest. The limestone colors add vividness to what is a very white Vermont in the winter. This is absolutely worth visiting every winter you’re near Burlington. The entrance to the Donahue Sea Cave is inviting with layers of color and enough head room for Andre the Giant. Next Post What’s in the bag in 2014? Ha! Nice Pete! Thanks for sharing.